Pictured is a new screeenprint from Insa set to be released tonight at the opening of Perscription Art's Haters exhibition opening in Brighton later this evening. The print will be a 3 colour quality screen print, signed and numbered- available tonight at the show and then tomorrow online. 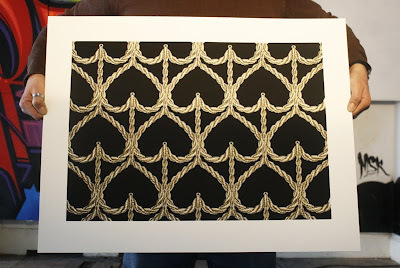 There will 3 colourways of this print: Black background (seen above), Pink background and Mint background . 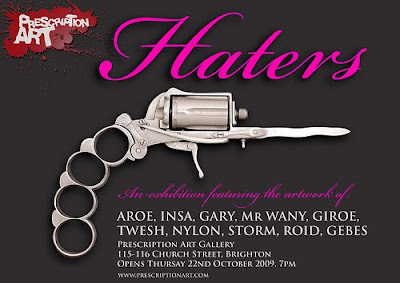 The "Haters show" opens tonight in Prescription Arts temporary home in The Old Music Library in Brighton. The show will features new works from Insa, Nylon and the Heavy Artillery Crew. The gallery is undertaking a huge transformation.... we are told that you'll be blown away by the results! Please email haters@prescriptionart.com to confirm attendance at the Private View tonight.